What do we need the most when in the kitchen? The answer is, of course, hot, boiled water. Whether you are cooking or cleaning, or simply making a cup of coffee for yourself or a bottle of formula, you need instant access to hot, boiled water. The quickest way to that would be by using the best electric kettle you can get your hands on. Electric kettles work in minutes to get you boiling hot water with the minimum fuss and effort, and this is an appliance the modern kitchen is incomplete without. Read on to know more about electric kettles: what to look for in them, why to buy them, how to take care of them, which are the best at the moment, and much more. Why should you get an Electric Kettle? The electric kettle is one of the smallest appliances you can find in the modern kitchen, but it is also a very important one. This portable and convenient little appliance can give you boiling water whenever you need, everywhere there is an electric power source available. Electric kettles come with their own heating base, so you don’t need an open fire or any kind of stove for it. This is why, you can see an electric kettle in hotel rooms, dorms and even trains these days! Previously, water was boiled in an traditional stove kettle or even an ordinary pan which is much more time-consuming. 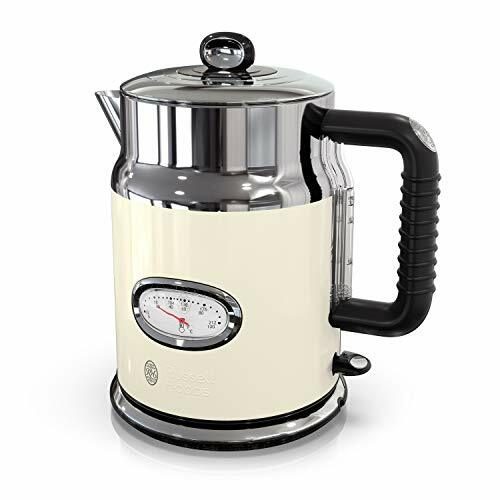 While tea lovers still use stove kettles to keep cooking their tea leaves beyond a boiling point in a stove kettle, it is much more convenient and fast to use an electric kettle for everything else. You can carry them anywhere, and use them in every room of the house; you can travel with them anywhere there’s electricity for an instant cup of coffee or any other hot beverage. Families with infants love these electric kettles for making formula and baby cereal within minutes. This sturdy and military-grade electric kettle isn’t just effective and convenient, but also a pleasure to look at. Its manufacturers called it “The Lamborghini of the coffee World”, since this is the perfect companion for you whenever you feel like making coffee, or any other hot beverages. According to the concept of “Pour Over kettle”, you can pour boiling hot water on your cup of instant coffee and get the perfect taste. 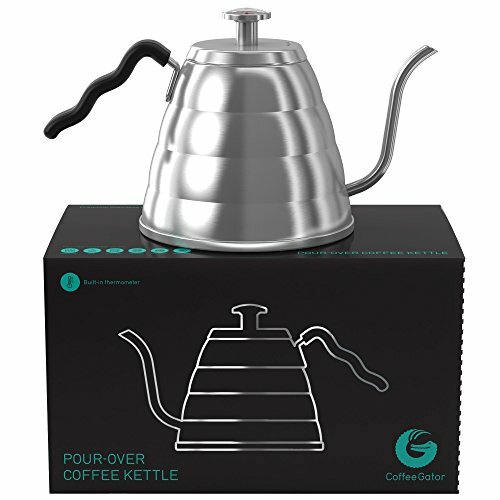 The Coffee Gouter Pour Over is made from stainless steel and has a narrow, goose-neck spout that makes water flow out smoothly and without any kind of splash. This means that you will not splash or drop any water when pouring even when you are being careless or distracted. The built-in thermometer on the top of the lid lets you know when it is the right time to pour water or add your coffee beans or tea leaves. The right temperature lets you make the perfect cup of coffee or tea that you need first thing in the morning, or throughout the day. This Electric kettle from Coffee Gouter is 16.5 cm in height and holds about 1.2 liters (42-ounces) of water in one time. You can boil a little over 1-liter water with this kettle; any more and there is a chance of overspill. The AmazonBasics Electric Kettle is made from sturdy stainless steel and can hold around 1-liter water. It has a 1500-watts power that boils and heats one liter of water in about a minute. This kettle comes with a heating base that you can plug in anywhere; the 1500-watts of power boils 1-liter of water within a minute and gives you fast results. This is a no-nonsense electric kettle that gives you exactly what you want! The kettle itself is cordless and portable, which makes it easy to refill, pour and wash. You only need to place it on the heating base and flick on the switch for the kettle to start working. The cord is attached to the heating base that you need to attach to a power supply. The cord is extra-long at 30-inch but you can also wrap it safely inside the base for storage. The Amazon Basics also comes with a removable filter for your tea leaves and coffee beans. It shuts off automatically immediately after the water has come to a boil, so that you can relax and even forget about it. A transparent window on the side gives you the chance to take a look inside without opening the lid. This comes in handy if you want to check the water level or if you want to know if the water has come to a boil yet. Yes, this stunning electric kettle from COSORI is actually made from Glass! It is not only beautiful to look at, but you are also going to love just how efficient and convenient it is. The whole thing is made from high-quality borosilicate glass which will not get too heated, scratch or scruff. You can use this sturdy electric kettle without any worries at all. 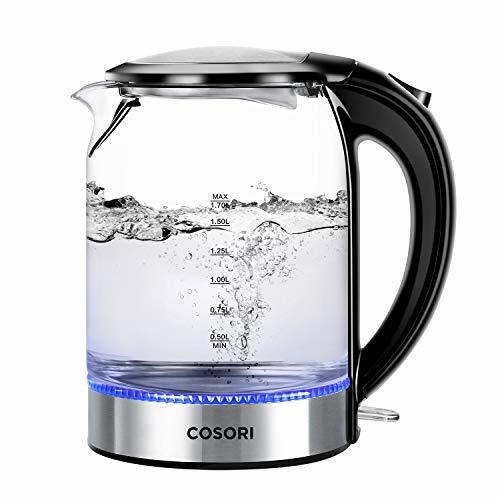 The COSORI Electric kettle comes with its own heating base that you need to boil or heat water. You just need to plug in the heating base to an electrical power source and put the water-filled kettle on top of it, and the water inside will start to boil. This kettle holds 1.7-liters of water at one time, which is definitely more than the average capacity of similar products. 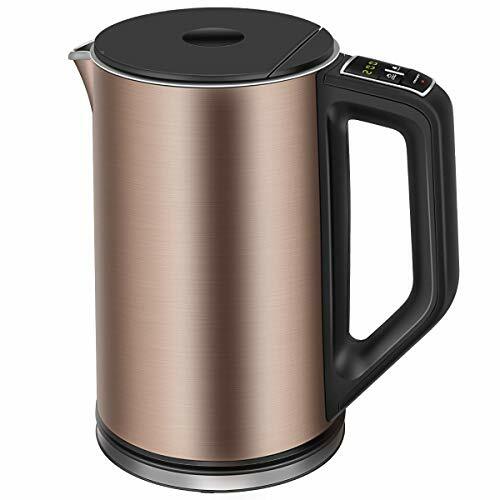 If there are multiple tea/coffee drinkers in your home, or if you need a huge amount of water every now and then at home, this is the perfect electric kettle for you. Although the body of this electric kettle is made from glass, the bottom and the lid are made from stainless steel for added sturdiness. It has the measurements written on the sides, and a LED light indicator that shows you when the kettle is in action. The beautiful blue light on the bottom of the kettle will turn off when water is completely boiled. Besides, the kettle will shut-off automatically when it is done. Russel Hobbs is one of the most popular brands in the world that makes kitchen appliances and gadgets, and the KE5550CRR happens to be a popular model among electric kettles. This kettle is convenient, portable and easy-to-use, as well as efficient and time-saving. It is made from sturdy stainless steel and gives you water of perfect temperature for your coffee, tea and any other hot beverages, formula and baby cereal. This is a 1.7-liter capacity kettle where you can boil water for more than 3-4 people. The quick boil indicator on the outside lets you know the moment that your water has reached optimum temperature, which is a big help when you are in a hurry. Besides, there is a large thermometer on one side of the kettle, which shows you the temperature of the water inside. If you have a particular temperature you want your water to be - for cooking or otherwise - you can take out the kettle when the water reaches that temperature. The pour spout is small and narrow, and prevents any kind of splash or drip. Even if you are pouring from a height, the special design won’t allow a single drop of water to pour over and cause an accident. You can remove the kettle from the corded heating base for cleaning or refilling, and the removable filter can also be cleaned easily with water. All you need to do is yo place the kettle on the heating base and push the button, and the water will start to boil instantly. This is another extremely beautiful one from our list of the best electric kettle for coffee and tea that has a maximum holding capacity of 2 liters, much more than similar products in the market. This particular model is from TOPWIT, and is as efficient as it is aesthetically pleasing. It is made from sturdy transparent borosilicate glass that will not shatter or get heated, and will look beautiful wherever you put it - in your kitchen or in your office. What makes this electric kettle more beautiful is the row of LED lights on the bottom that light up when water is being boiled, and shuts off when it is done. This kettle may look delicate, but it has a sturdy built that will last you years. It is completely resistant to thermal shock. The lid and the base are made from stainless steel rather than plastic, which is also the healthier option. The kettle shuts-off automatically when water comes to a boil, so that you can forget about it if you want to. You can boil or heat 2 liters of water in it at a time for everyone’s hot beverages, a larger capacity than most other models out there. This beautiful little electric kettle from SMEG will remind you of the raging 90s, with a shape that looks like a rocket ship. 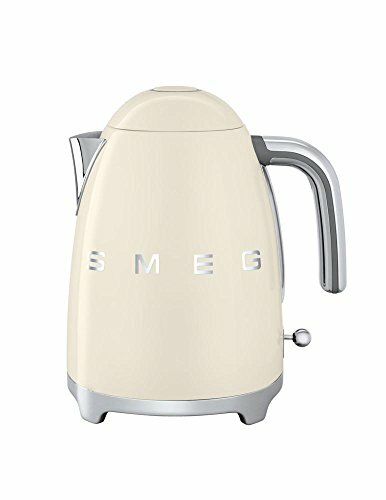 Made from durable stainless steel insides, you can see the 3D logo of SMEG embossed on the sides. This kettle holds 1.7-liters of water, which actually amounts to 7 cups of water. So if you have company over and need to make hot beverages, this is the electric kettle you need to keep up with the demand. The lid and the handle are made from stainless steel with a soft chrome finish. The spout is small and narrow and quite easy to handle. It helps you avoid splashes even if you are pouring hot water from a good height. There are double indicators of holding capacity on the side, both in liters and in cups. The kettle will shut off automatically when water has reached boiling point at 100-degrees C, or when there is no water inside the kettle. A removable stainless steel filter comes with this kettle that you can use for your lime scales. This is a one-push operation kettle that is extremely easy to turn on with a single flick. The cord is attached to the heating base and can be conveniently wrapped and hidden away, and the kettle itself is completely cordless. This electric kettle from CHINYA is a great choice if you are looking for an aesthetically pleasing electric kettle for both inside and outside the kitchen. This model from CHINYA will look great in your workplace, home office, study or dormitory, or even in your dining and sitting room. This electric kettle holds 1.8-liters of water that can be boiled in a matter of minutes for your coffee, tea, hot chocolate, or for formula or cereal for your child. 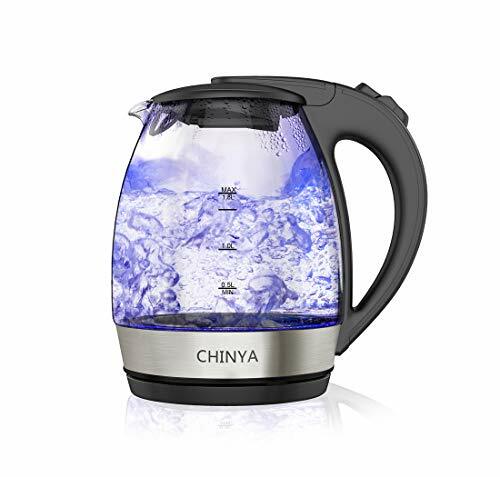 The CHINYA Electric kettle is as safe as it is durable, and made from a borosilicate glass material that will not shatter or scratch. You can use it every day and for a long duration, and not have to worry about its performance. The blue LED indicator light at the bottom will remain on as long as the kettle is on, and automatically shut off when water has boiled. It is a beautiful scene when your water starts to boil, something to watch as you are waiting for hot water. 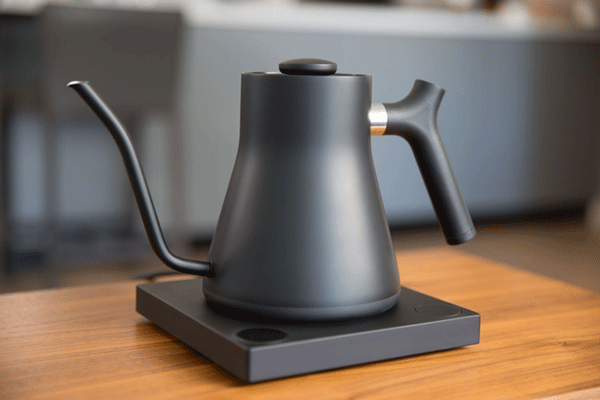 This kettle from CHINYA has a narrow mouth that avoids any spillage or drips when you are pouring, even if you are pouring from a considerable height. The cord is attached to the heating base and not the kettle, which allows you to carry it further away from the base to pour water. Since it is such an aesthetically pleasing kettle, you can use it to serve water for tea for your guests. The kettle shuts off automatically when the water has reached boiling temperature, so you don’t have to worry if you ever forget about it. This professional looking electric kettle from Home Gizmo is quite efficient when it comes to regular use around the home. The entire thing is made from stainless steel and comes in a sleek chrome shade. The kettle stays cool to the touch even if the water inside is boiling hot; the kettle has dual walls so that the hot water stays warm for a long time inside. With this kettle from Home Gizmo, you cannot exactly control the temperature, but you can know exactly what the temperature is. The LCD display on the handle shows you the exact temperature your water is at, within 90℉ to 212℉. The measurement is quite accurate, with a margin for error of ±10℉. You can just remove the kettle from the heating base when the water has reached your preferred temperature, or switch it off. You can heat and boil water in less than 5 minutes in this electric kettle, with a 1500-watt power. 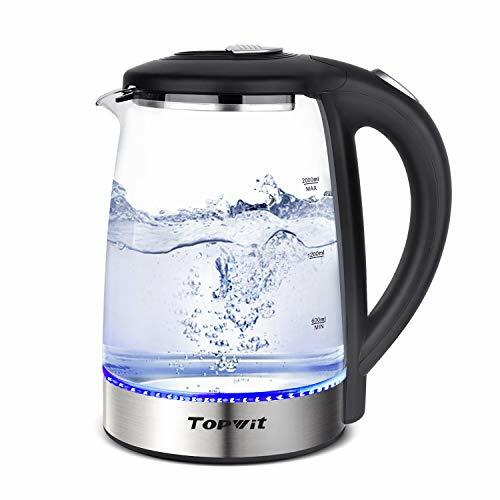 This can be considered relatively slower compared to other electric kettles, but it is believed that the slower water is boiled, the better it tastes. This electric kettle takes a slower approach to boil water to give your tea, coffee or hot beverage a better taste. Electric Kettle: How to keep the Temperature under control? While there are a few electric kettles available in the market where you can control the temperature, they are usually quite expensive and exclusive. With these electric kettles, you can choose from multiple pre-set temperatures and select the one you need. These multiple pre-set temperatures are usually set for boiling water for dechlorination, hot for coffee, for sterilizing baby bottles and other utensils, for warm drinks, etc. Tea lovers use these variable temperature settings to make different kinds of tea, as such: green tea, white tea, oolong tea or milk tea. The more common electric kettles in the market do not come with pre-set temperature options, but some of them do come with built-in thermometers. If you are looking for an exact temperature in your cooking, cleaning or for your hot beverages, you can wait until the water reaches that temperature. When the water inside the electric kettle reaches your preferred temperature, you can simply switch off the kettle or take if off the heating base, and the water will not increase in heat. Most electric kettles that we see everywhere neither have variable temperature control nor built-in thermometers. They keep on working until the water inside has reached boiling point and then stop. If you own such an electric kettle or if you are planning to buy one, you can always use a separate cooking thermometer immersed into the water. The thermometer will accurately show you the exact temperature of the water; you can take out the kettle when it reaches your preferred temperature. However, with electric kettles, it isn’t exactly possible to insert a precise temperature and expect your water to be just that. You can achieve a temperature nearing the one you want by using a cooking thermometer, with an electric kettle with a built-in thermometer, or simply by mixing your boiled water with room-temperature water. Q. Can I use an electric kettle on the stove? A. No. An electric kettle should only be used on the heating bases they come with. You cannot use an electric kettle on any kind of stove. There are different stove kettles available in the markets that are suitable for gas, induction or electric stoves. Q. Can I keep water hot in an electric kettle? A. Electric kettles usually shut off automatically when the water has reached a boiling point, and depending on the model, the water inside stays warm for the next 15 to 30 minutes. If you want the water to stay hotter than that, you have to switch on the electric kettle again and bring the water to a boiling point again. Q. 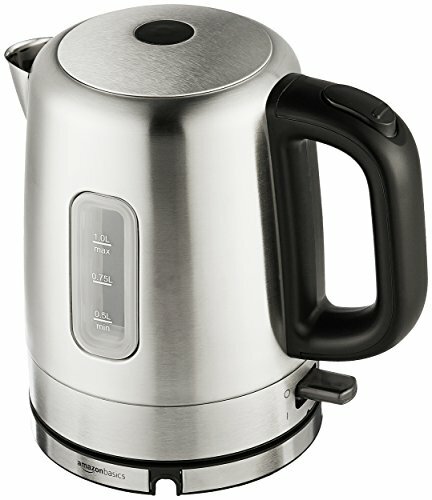 Can I use an electric kettle for making tea? A. The point of an electric kettle is to boil water or heat water to pour over your coffee beans or tea leaves, or any other hot beverages and food. However, some kettles also come with a removable filter where you can pour in your tea leaves, but the water will stop boiling after a certain temperature. To keep on boiling your tea leaves way beyond boiling temperature, you need a stove kettle to be used over a stove. Q. How can I clean an electric kettle? A. Electric kettles can be cleaned with plain water and soap every now and then. However, to properly clean it, you need to add a few pieces of lemon or a few drops of vinegar to water inside the kettle and bring it to boil. Once the water reaches boiling point, leave the lemon pieces/vinegar water inside for an hour, and then wash with room-temperature water. This will get rid of any smell or rusting on the inside. Q. Do I need to look for any extra features? A. Electric kettles are extremely basic kitchen appliances, and they don’t need many extra features. What’s important is that you look for a sturdy built that will give you years of use. However, added features such as a built-in thermometer, light indicators, alarm tone or a sleek design can be an added bonus in an affordable model. Q. Can I put tea bags inside an electric kettle? A. Generally, yes, unless the instructions ask you not to. However, if you put tea bags inside an electric kettle, you will need to wash the insides more often than is normally required. Electric kettles are one of the most basic, one of the most affordable, one of the smallest, and yet, one of the most important appliances you can have in the modern kitchen. An efficient electric kettle gives you instant boiling water whenever you need, in your cooking or preparation of food, or in cleaning and sterilizing. It is a must-have item in the kitchen for frequent tea or coffee drinkers, or a parent with a young baby. These electric kettles are not hard to understand or buy, but you definitely need to look for a model that will give you years and years of use without any problem.